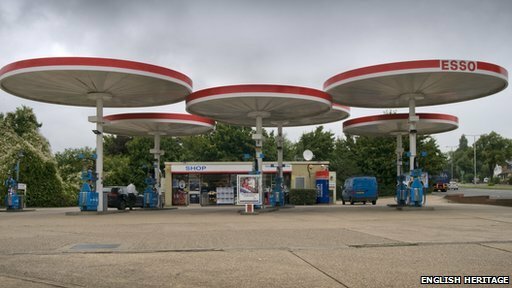 Two petrol station canopies are to be given listed building status. John Minnis, from English Heritage, told the Today programme that the futuristic designs hark back to a time when driving was still considered an adventure. One, Markham Moor off the A1 is architecturally innovative, he says, using technology that was "cutting-edge" for the 1960s. The other, on the A6 near Red Hill, is the last surviving forecourt designed for Mobil in the early 1970's.